It’s a pretty good day when you receive an enquiry requesting a Barcelona Destination Wedding Video. Hiram and Marylise had come across Matt and Jo’s Wedding Film when searching for venues and loved our work. We got talking at the end of last summer it transpired that we were both moving from our respective locations to Toronto in the coming months! A touch of fate perhaps? We were actually able to meet in person and chat about their videography needs, rather than doing it all over Skype. It also meant that Marylise could talk to Danielle (who also owns alldolledupstudio.ca) about her hair and makeup and have her trial before the wedding too. Personally, I love filming weddings in Europe (who doesn’t?!). For one thing, its a great opportunity to stop by London on the way and visit friends and family. But its also a chance to film at some of the most beautiful locations in the world. Just look at these venues! Admiral De La Font is a venue of history and beautiful architecture, surrounded by palm trees and vineyards. But an amazing venue is nothing without wonderful people to fill it with. Hiram and Marylise are the sweetest couple you could meet. They’re energetic, adventurous, find and bursting with unique ideas. They had surprises for each other throughout the day and truly lived the experience of being surrounded by loved ones. They have lived in multiple cities across the world and made many close friends along the way. As someone who lives across an ocean from my family and old friends, the scenes of guests arriving one by one the day before the wedding really speak to me. Being reunited with people you love and haven’t seen for such a long time is a really special experience. Having them all travel from across the world for your wedding is a feeling I can’t describe. Danielle and I were married in Italy and when ever we film a destination wedding it brings back a lot of memories! The actual ceremony took place at Tibidabo Cathedral (Temple Expiatori del Sagrat Cor), perched on top of the hills surrounding Barcelona. How could we not do our best to shoot this amazing place (see aerial shots and hyper-lapse!). If you ever go to Barcelona its a must-do activity with breath-taking views over the city. The on-looking tourists added to the grandeur of the moment, gazing at the beautiful bride as she walked towards the huge doors of the church. Its one of those slow-mo moments for sure. When meeting Hiram and Marylise, you can’t help but warm to their down-to-earth, humble nature. You would never think that their wedding would feature a mass release of butter-flies, a Spice-Girls tribute routine, a choreographed first dance and a Spanish inspired dance-off. But all those things really happened. You see, this is a couple with imagination and the conviction to see their ideas come to life. Marylise’s speech wasn’t just a list of “thank-you”. It was a rendition to her guests set to her favourite Disney songs. Hiram chose to play guitar and serenade his bride. They invited guests from all over the planet to a wedding over-looking once of Europe’s finest cities and gave them a party to remember. We love working as Wedding Videographers because we get to meet people from all walks of life. Every couple is different. 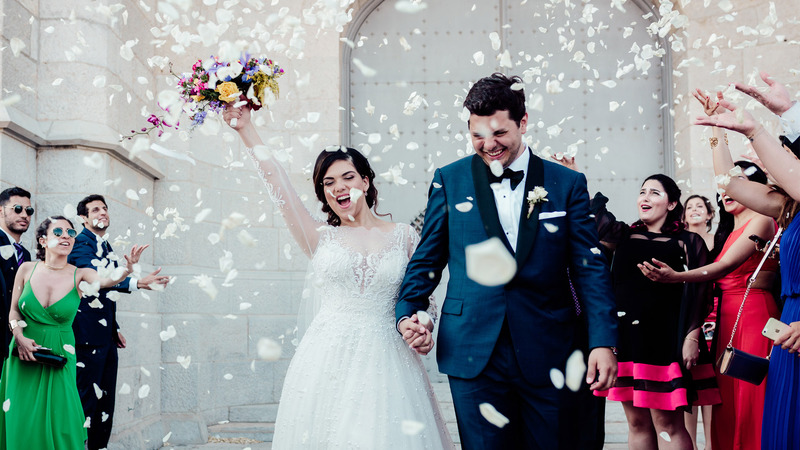 Having got to know Hiram and Marylise, it makes absolute sense that their wedding was an off-the-charts celebration. It was adventurous, humorous, loving and sincere.We feel so lucky to have shared the experience and are very proud of this wedding film. Enjoy!